Matthias Maiterth is a PhD Student with experience in power and energy aware High Performance Computing. His studies include research exchanges with Lawrence Livermore National Laboratory for his Masters Program, as well as during his PhD studies. After finishing his Master's degree in 2015, he joined Prof. Kranzlmüller's research group at the LMU Munich. 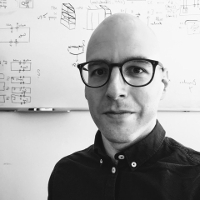 Matthias Maiterth is currently funded by Intel to continue and finish his PhD research at LRZ in Munich in the area of Power and Energy aware Runtimes Systems in High Performance Computing.